LOL. Poor Jar Jar… I thought he & Aayla were making out. Until someoen said he was getting beat up. So I guess you have no need for that McFett now? Yea, Jar Jar is getting the beat down. Not my best background work though. I was in a rush on that one and didn’t reshoot. Should have, maybe one day I’ll do a “Special Edition” and clean it up a bit. 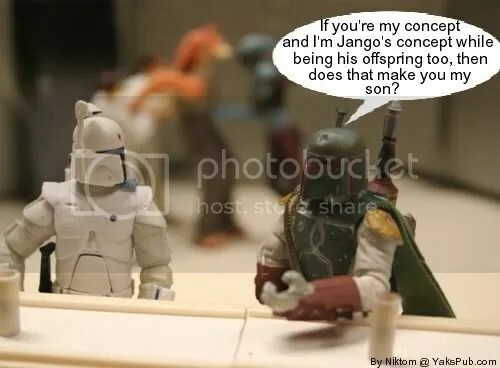 Actually I do still need a McFett, well actually my son does. I’m not stressing though, I found that one nearly 3 weeks ago. They will show up some more around here soon. still cant find the mcfett.